This has to be one of Tobago's jewels: a green-blue sea surrounded by a wall of lush, shady trees including almond and coconut palms. 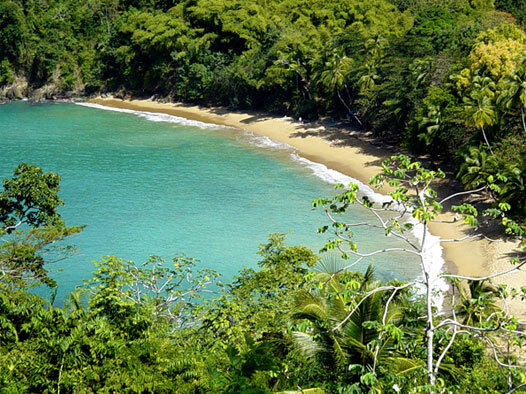 The Englishman's Bay River meets Rockly River directly behind the beach. These rivers separate the beach from a patch of woodland between the beach and the road. The beach slopes steeply down to the sea which has short but often large breakers, making it tricky at times to get in and out. But once in the sea you will appreciate just how lovely the beach, its surroundings and the sea are. There's great snorkelling at either end of the beach from the coral reef, which is alive with multi-coloured tropical fish. There is a small restaurant serving local dishes at reasonable prices, and some quite high quality craft stalls offer a completely different stock to other stalls around the island. A visit to this beach is a must for every holidaymaker.